Is your staff always on the move? Sangoma’s wireless phone is your answer! 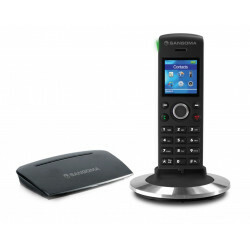 The DC201 DECT phone system is the first wireless phone from Sangoma. Designed to work exclusively for FreePBX and PBXact phone systems, the DC201 is perfect for small-to-medium sized businesses looking for a high-quality wireless DECT solution that integrates into their IP PBX. Business moves us. Whether you are on your way to a meeting, grabbing something from storage or just stopping by the vending machine for a snack it is important to always be reachable. The Sangoma Wireless DECT phone system gives you that power and more. This phone is designed to work exclusively with your PBXact and FreePBX systems that you already love making integration a breeze. So go ahead, get yourself that extra candy bar you don't have to worry about missing a thing. 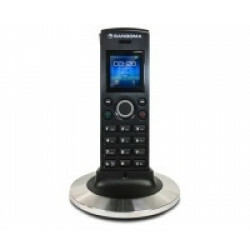 Sangoma Entry Level DECT handset D10M (N. America PSU). An extra handset to attach to your Sangoma DC 201 base.